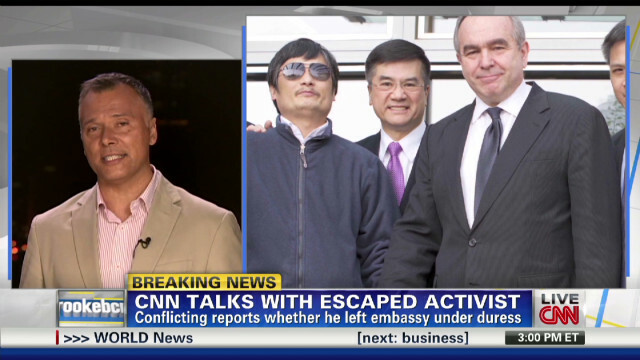 Chinese activist Chen Guangcheng spoke to CNN’s Stan Grant Thursday from his hospital bed in Beijing. Chen says he feels let down by the U.S. government, and wants to leave China because he believes his life is in danger. Chen said he has also learned that Chinese officials rounded up some of his supporters after his escape and placed some of them under house detention. He said he was appealing to U.S. President Barack Obama to do more about human rights in China. Chen’s wife told CNN that she does not want to raise her children in China, where she said they would have no future. Earlier this week, a CNN team – including Grant – was chased out of Chen’s home village of Dongshigu in Shandong province. Watch that report here.